After 37 years of silence, actor Anthony Edwards finally reached a point where he was ready to honestly answer the questions his mother had posed to him in regards to inappropriate behavior by Edward's mentor and friend, Hollywood producer Gary Goddard. In his 2017 essay entitled, "Yes Mom, There is Something Wrong," Edwards, who is best known from Top Gun, ER, detailed the sexual abuse he and his group of friends endured at the hands of Goddard, and the long road to recovery Edwards faced in relation to it. 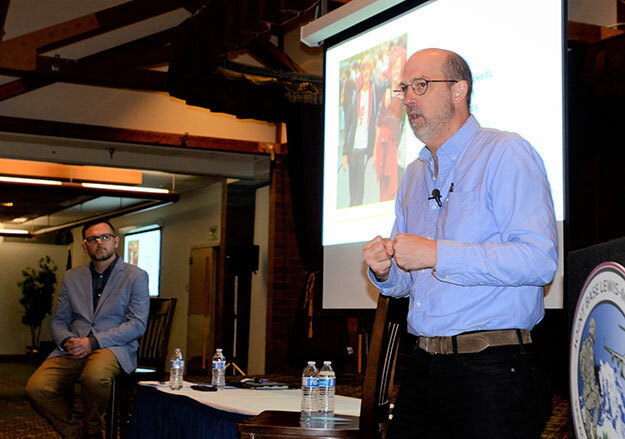 Edwards and Matthew Ennis, 1in6 CEO, were guest speakers at the "Normalizing the Conversation; For Male Survivors of Sexual Abuse and Assault" at the Club at McChord Field April 9. The event was put on by the 62nd Airlift Wing's Sexual Assault Prevention and Response Program for Joint Base Lewis-McChord. Since going public two years ago, Edwards tells his story to help others, such as himself, come to terms with abuse and start the healing process. He primarily shares his story through the nonprofit 1in6, which aims to help men who have been victims of sexual assault or abuse -- about one in six men -- live happier, healthier lives. "When I came out with a letter of my experience, it really cemented a knowledge on my part that I'd reached a part in my recovery -- that I was ready to be of service," Edwards said. "And it's been a revelation to redefine life not through a foundation of fear, but through a foundation of love." Ennis said the goal of the conversation was to try and break the stigma attached to men who report instances of sexual abuse and assault. "It is one in six men who have experienced sexual assault by the time they're 18, so we're talking about 10, if not, 20 million men in the United States right now," Ennis said. "The simple fact is that men stay silent traditionally an average of 30 years. Our goal is to start lowering that age by breaking stigma and normalizing the conversation." After sharing their deeply personal stories of being sexually abused as children with an audience of more than 100 people, Ennis and Edwards talked about the myths and facts associated with male sexual abuse and assault. They also spoke about ways in which the audience could support survivors of abuse. "Be approachable and available to make sure the guys know you're someone they can talk to," Ennis said. At the same time, Edwards said it's critical to listen if someone trusts you enough to speak about sexual abuse. "The only way out is to talk and to share, and that requires people to listen -- like all of us here," Edwards said. "Listening is so important, and you're not going to have the solution to fix it, but you can help by supporting." Major Ryan Ley, 62nd Operations Group, said he came to the presentation so he could learn the right way to help his airmen when it came to reports of abuse and assault. "It's important to really understand what (sexual abuse survivors) go through and how to approach that subject so we can have an environment that's inclusive and open to everybody," he said. "I think the big thing I learned, is number one, let them come out with their story under their own terms and just be open and listen." To learn more about male sexual abuse and assault and to find resources to assist in recovery, visit 1in6.org. For anyone on JBLM who needs help now, call the 24-hour JBLM Victim Advocate Hotline (Sexual Assault Reporting) at 253.389.8469.